Ok, for my first announcement, you have to check out the new All Things Unity challenge blog. A few of us Unity Addicts lead by my friend Sara Henton have gotten together to create a blog for YOU! There will be challenges and chances to win awesome prizes! And you can use Unity OR Ippity to play along. 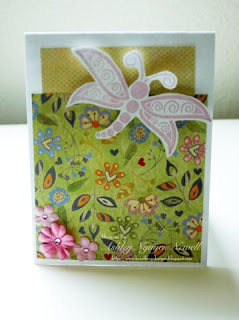 This first week's challenge is to make a sunshiney card! :) And my sweet Sara is offering up a prize! The prize this time is Unity's This is The Time miniature set. You have until March 18th, 11:59pm EST to link your creation to the All Things Unity blog to be entered to win. I have another card and another announcement. Though the anouncement has nothing to do with the card. I'll do the card first. This is a card I made for Jen del Muro's Sketch for You to Try last week. Also, for Taylor Vanbruggen's Dragonfly Card Drive. It is such an AMAZING cause! Please check it out! This card uses Unity's Butterfly Beauty set. The paper is Basic Grey's Sugar Rush. The flowers are Prima and the bling is Kaisercraft. Ok, my ANNOUNCEMENT! I've been selected to be on the Creation Inspirations Paints design team!! I am so excited to be working with this brand new company! Be on the look out for my creations using these paints in the near future! Both your cards are awesome. Congrats! I can't wait to see what creative goodies you will do with all the paints. Dang girl, do you ever sleep? You have been cranking out the cards! Beautiful! And congrats on all the exciting news!!! LOVE these Ashley!! And how fun that you are on the ATU DT!! I will be following along with you guys!! 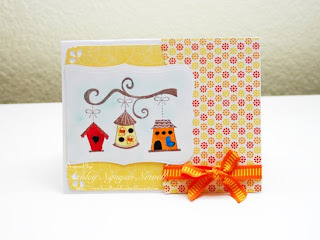 What exciting news and fabulous cards! I'll have to try to fit in some time for the Unity challenges...I have so neglected my stamps lately. And congrats on the new DT position...can't wait to see your painted projects! CONGRATS, Ashley! YOU ROCK--you are so creative and clever!! Both of your cards are AMAZING:) LOVE LOVE LOVE visiting your site! these cards are wonderful, so amazing! COngrats girlie...both your cards are amazing and those paints look pretty fabulous to me! I bet they will be fun to play with! Beautiful card. Just checked out the site All Things Unity and what a great site. Congrats on your DT position! beautiful cards and big congrats to you!!! this is awesome love the card and the new site!! Wonderful projects and can't wait to check out the new blog! Awesome! congrats ashley! i bookmarked the unity challenge for later! Oh lots of fun Ashley! Congrats! Wow - great cards! And congrats - look at you, busy as ever! Can't wait to see the paints. Pinch some baby-cheeks for me! Fun card and fun colours! I think you your project are lovely.... and Congrats girl!